Of course she’s totally bummed at having “failed,” but Tom reminds her that, while she may not have changed the world, she changed the world for that one dog. In so many words, anyway. On that note, I wondered what an “I’m Sorry I Adopted ALL THE ANIMALS!” stack of pancakes might look like. Just how epic would this breakfast food have to be to distract your spouse from the snake slithering across the living room floor? 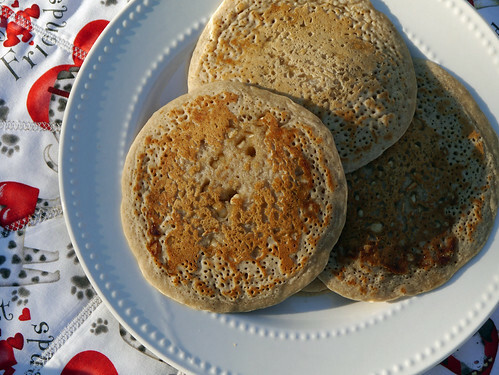 One thing such pancakes would definitely need: vegan white chocolate chips. People! Why didn’t anyone tell me how delicious white chocolate is! 36 years on this earth, and I’ve never tasted anything like it. Also: Cherries. More specifically: cherry pie filling, watered down (with a touch of cherry extract to preserve the flavor) to make a chunky cherry sauce. That prepackaged stuff is as unhealthy as all get out, but holy what do I love it. Plus it’s super-convenient, so there’s that too. And don’t forget the sprinkles! Chocolate sprinkles make everything better. Except dogs. Don’t do it! 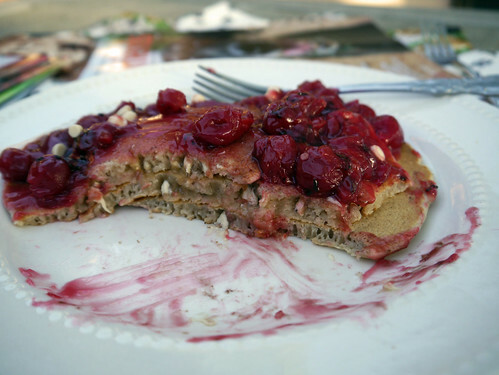 For the pancake recipe, I used my all-time favorite: the Perfect Pancakes from Vegan Brunch. The name doesn’t lie; these are seriously the best pancakes I’ve ever had. Photographed with a fat stack of Best Friends magazines just because. 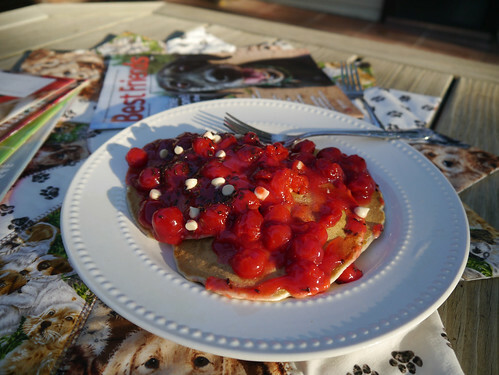 To turn them into White Chocolate Chip Cherry Pie Pancakes with Chocolate Sprinkles, double the recipe and add one cup of VeganSweets White Chocolate Chips. 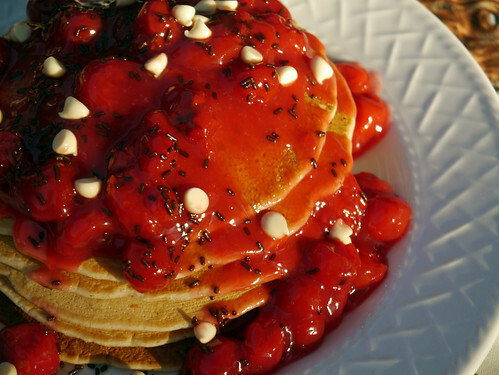 To make the topping, combine a can of cherry pie filling with ~ 1/2 cup of soy milk and 1/8 teaspoon cherry extract and ~ 1/4 cup sugar; cook on medium until heated through, and then reduce to low while you’re making the pancakes. Top with sprinkles – the chocolate sprinkles are Edward & Sons Let’s Do®…Sprinkelz – and extra white chocolate chips. If the cherry pie filling is hot enough, the chips and sprinkles will get a lil’ melty! This entry was posted on Friday, September 19th, 2014 at 1:17 pm. You can follow any responses to this entry through the RSS 2.0 feed. You can leave a response, or trackback from your own site. Oooooooomg. 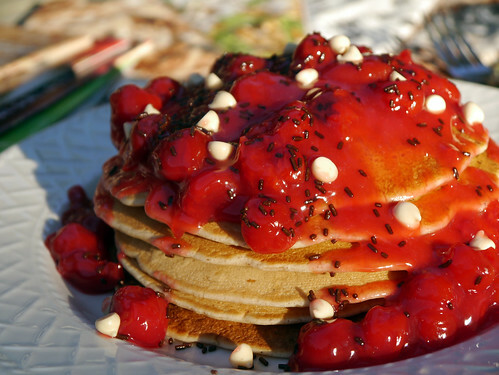 I need that stack of pancakes to be in my stomach. I was never big on white chocolate before going vegan, but for some reason the fact that I now can’t find a vegan version makes me crave it constantly. Stupid brain. I nominated you for a Liebster award! (http://www.oddlittlevegan.com/about-me/liebster-award-and-tofu-scramble/) Feel free to ignore it though, I know it’s not everyone’s cup of tea. And now I need tea. It’s like my brain is suddenly a 3yr old. @Kate – Aw, thanks! Maybe I’ll put it in the end-of-mofo roundup! 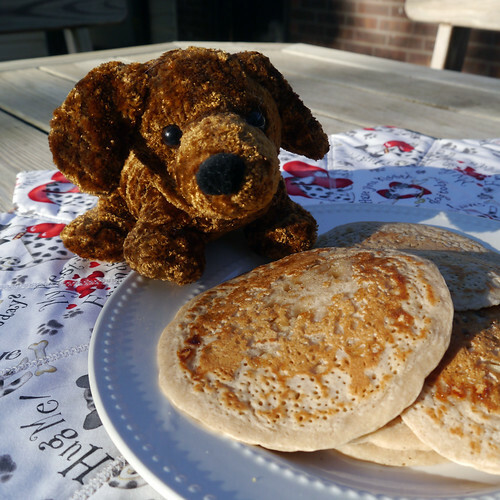 A delicious stack of pancakes would make me forgive almost anything! Though you are own with the white chocolate, disgusting stuff. ;) However some dark chocolate chips + cherries + pancakes sounds like heaven to me.